My family and I would travel an hour to the nearest town to fill our water buckets and rinse our bodies off at the local car wash. Life was all about survival. I was the fire starter in this family, the person pushing our momentum at every turn. Whether planting seeds for vegetables, hand-digging a well, or refining our pioneer lifestyle, concern for our highest good was my top priority. It is what I did, it is what I do, and it is who I am – an innovator and visionary, I certainly think outside the box. Hauling water from the car wash to our semi-desert area was key for us to keep our crops and livelihood going. While the kids played and the bells on their boots jingled, I remained focused on our vision. After about six weeks of hauling water, we decided to begin the daunting idea of locating a natural water source. Our property was on top of a very high mountain and we could see the Columbia River and the snow packed mountains of the Cascades far in the distance. I witched a well site with a willow bough through a process called dowsing. The willow bough bends in your hand if it picks up the vibrational scent of a water vein in the earth. I was a believer in the most abstract systems and this fit into my beliefs perfectly – it was free and not fancy. The digging began. Each morning, my husband and I would take turns shoveling dirt, rock and clay before the midday heat arrived. In the evening cool, we would begin again. It did not take long to hit the kind of clay and rock we had to pick ax through. The optimism we had, as I think about this piece of the journey, truly blows my mind. I thought we would hit a gusher any time only to realize we had to go another foot and then another foot. Our progress was slow, the well narrowed and eventually I had to get inside with my baby bucket and a spoon. My preferred digging attire was wearing nothing except my high top boots. It was miserable. At the end of each day after I climbed out of the hole, I would pour a container of water over my head to wash and cool off. This was my reward and my semi-clean clothes were waiting for me. My old notes on this story say I dug down 22 feet but even that seems a bit unbelievable. The story, however, is true. I’m not sure if it was perseverance or just plain crazy, but it took about a month of digging before we finally decided to hire a well driller. They went 400 feet before they hit water. Yikes! I think I’ll go with crazy on this – and a big E for big effort! 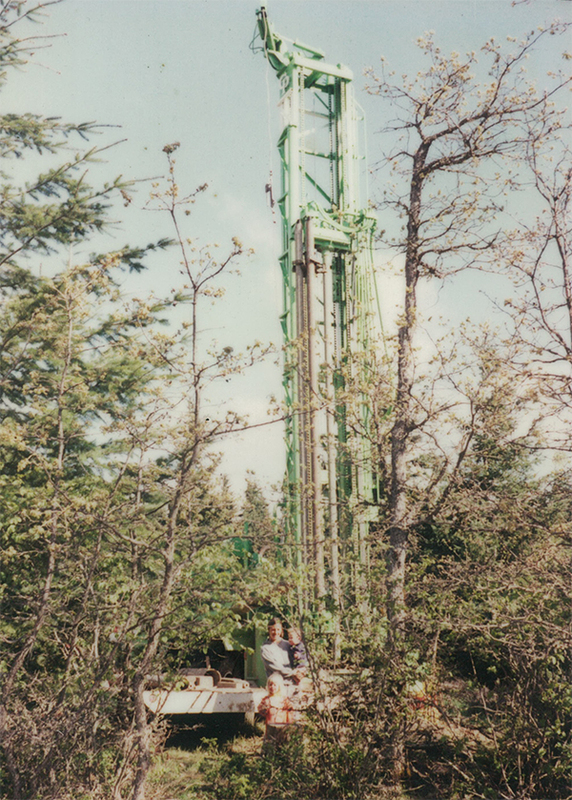 My husband, sons and I were overjoyed when the well driller said “we hit a strong vein!” I remember thinking, “Wow, maybe this whole idea of homesteading on this parcel is real.” Fun to fantasize, right? Within the next 24 hours we were told that it would cost a tremendous amount of money, thousands of dollars, to case the well. While my husband tended to his plants and my babies played dump truck until the sun went down, I pondered our existence. I was tired and I started to wonder if we could really do this lifestyle all while going through the motions of daily survival – food, shelter, bucket baths for the babies. I heated water on our small propane stove, made homemade bread and pot after pot of beans. Our staples. We had a very expensive hole on top of a very big mountain and all we can do is cover it with a piece of wood so the babies won’t fall in and once again dream of water. We lived by the seat of our pants. We had no plans. Each day I woke with new concerns. As time went on, our make shift dwelling took a bit more shape. We framed our walls with 2x4s and pitched our tents on the ground floor. My husband built a stairwell leading to what would become a second floor. For now it was our roof line providing shade and protection from the elements. It was the definition of glorified camping. We were about to enter summer season which would bring more critters, more snakes and more discomfort. While we continued to put our all our energy into our pioneer dreams, I was feeling isolated and still wondering if this was right for me. The nudges kept getting stronger. Nudges, heart strings, that feeling in our stomachs, the weight on our chest, the feeling of being pulled…so many more ways too. Amazing how we often look outward for a sign, when our bodies can “feel” the whisperings of our inner truths. Thank you for sharing your truths. Hannah.